Google has launched a new service today. Its called Google Helpouts. Since you are on this page looking for a Google Helpouts Invitation Code, you probably already know about it. In case you don’t know about it, here’s a quick overview. Google Helpouts connects subject experts with people who need help with the respective subject. 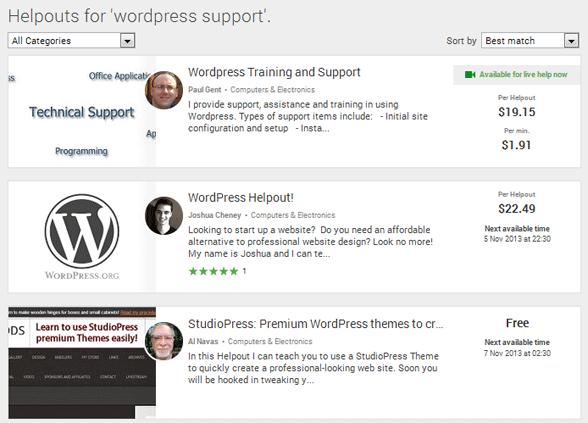 For instance, if you are looking for a WordPress expert, you can find out one on Google Helpouts and then hire him to help you with WordPress. A Google Helpout expert can either provide the service for free or she may also charge a fixed amount per Helpout or per time period (minutes or hours). While a Google Helpout session is in progress, a service buyer and a Hangout expert can use all the standard Google hangouts features to talk, share documents and screen to help better understand the topic under discussions or to fix the issue faster. Google Helpouts will probably the best solution for live help in future. And it may also emerge as an alternative to freelancing sites such as odesk and elance. Do You Really Need a Google Helpouts Invitation Code? If you want to hire Google Helpouts experts, you can do so immediately. You just need to be logged into your Google account and then start the Helpouts sessions instantly. But if you want to help others by starting your own Helpout, you will need a Google Helpouts Invitation Code to get started. You can’t create or start a Helpout without a Google Helpouts Invitation Code. We have some unused Google Helpouts Invitation Codes. Please leave your email address in the comments box below to receive it. Please note that the comments will not be approved, a Google Helpouts Invite will be directly sent to the email address you leave. We have a very limited number of invites for the Google Helpouts, so if you don’t receive it, then we are probably out of it. We apologize in advance if this is the case. Another way to get a Google Helpouts Invitation Code is to get it directly from Google Helpouts team. Click below and fill the form to receive the invite.